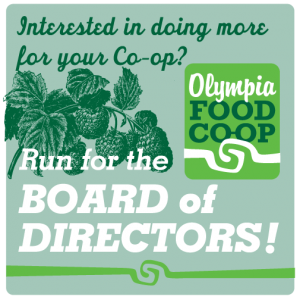 The Board of Directors is elected by the membership to serve a three year term for the Olympia Food Co-op. The Board establishes policies, oversees the operating and capital budgets, approves plans and recommendations, and sets general guidelines for staff and working members. They hold ultimate legal responsibility for the operations and actions of the Co-op. Board members also serve on various committees, such as finance, member relations, and expansion. Other responsibilities are listed in the bylaws, which the Board is responsible to uphold. Board members receive working member credit for their time spent in Board and committee meetings. The monthly commitment ranges between 10 to 20 hours. Elections are held October 15th – November 15th every year. I have no experience, can I apply to be on the Board? want to engage in board meetings and committee work? want to learn about our co-op, or have prior experience with other co-ops? want to learn about consensus decision making, or have prior experience in consensus decision making? enjoy food, cooperatives, volunteering, the democratic process? What are the benefits of participating as a Board member? What are the requirements for participation on the Board? How do I find out more information prior to applying?